Microsoft Security Essentials is a free antivirus program for Windows and is the successor of Windows Live OneCare. Microsoft released the beta of the program in June this year, and the final version is released today, it is rather quick. Download Security Essentials from Microsoft. 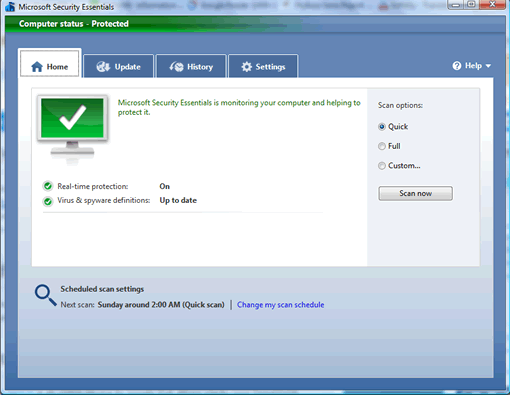 Microsoft Security Essentials offers protection against virus, spyware and malware, offers real-time protection. It is available for Windows XP SP2 or SP3, Windows Vista and Windows 7 including Windows XP mode on both x86 and x64 PCs. Microsoft Security Essentials is available in eight languages and 19 countries including Australia, Austria, Belgium, Brazil, Canada, France, Germany, Ireland, Israel, Italy, Japan, Mexico, the Netherlands, New Zealand, Singapore, Spain, Switzerland, the United Kingdom and the United States. Microsoft Security Essentials is good for people who canâ€™t pay for a security software, so far the reviews and the comments on various sites are favorable for the product. Although users may not switch from commercial anti-virus products to this free product immediately it will sure attract users who doesnâ€™t want to pay for a security software license. this best downlo0ad services in this sites. Lennon, if people are hacking your Facebook account, you should consider changing your password to a more difficult to crack sequence. This can be done by adding capital and lowercase variations, along with numbers and symbols. It may not be the most convenient thing to do, but it is certainly worth it in the long run. I cannot say that I’m surprised this is now a free offering. It seems hard to believe that MS even considered charging extra for a service that should be part of their OS. IF the OS is known to be porous, fix it – don’t just sell a product to address it! I have to agree with my namesake up there. MS definitely made the right move packing this in with Windows. I think their reputation in this sector is a bit too non existent for people to really rely on them for protection. All but the most novice of users will immediately look for secondary protection once they see MS is at the helm.